Changing the hand washing behavior in a community is a challenge of different disciplines, including psychology and media practice. Distinct beliefs prevent people from washing their hands properly in critical moments. Moreover, each segment of the community has a different belief. Hence, adults, children, women, and men should be addressed differently. This experimental study explores the process of isolating and changing the beliefs of grade six students from the Chandba Primary School, in Chilga Local Administration North Gondar Zone Amhara Region, in Ethiopia. The intervention activities are done to increase a positive association with water and soap concerning the three critical moments, namely before eating, before touching or preparing food, and after defecation. The study describes the overall practical implementations of combined behavior change theories, and shows how they can be applied to the selection of target beliefs. The present study identifies important variables that are negatively and positively associated with hand hygiene. The results are based on a questionnaire, observations, and practical evaluation of hand washing skills that were identified during the four week intervention. 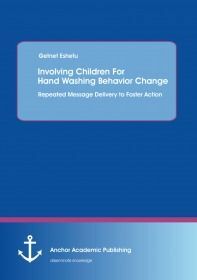 • The study helps to develop communicators to change children's hygiene behavior. • It has significance in helping the participants to understand better ways of using locally available materials and methods for hygiene facilities preparation. • It shows the effectiveness of combined implementation of practical participation and multimedia message delivery regarding hygiene behavior change interventions. In general, the study reviles the complementary effect of multiple communication tools and models of treatment as well as their appropriate analytic strategies to change participant’s hygiene behavior.